The U.S. Patent and Trademark Office on Thursday published an Apple patent application seemingly related to the company's upcoming HomePod speaker. In particular, the invention covers a method of equalizing and optimizing loudspeaker output through the use of microphones, digital signal processing and advanced computational algorithms. In its patent application for a "Loudspeaker equalizer," Apple notes the positioning of a loudspeaker in a given room can have great effect on sound reproduction. For example, a speaker placed in the corner of a room might increase radiated acoustic power at low frequencies, causing bass-heavy sound. Similarly, the position of a user respective to the speaker might negatively impact perceived frequency response. To compensate for distortion and other effects, audio equipment manufacturers have long employed digital equalization techniques that optimize audio output. For example, setup procedures of products like surround sound home entertainment systems utilize remote microphones to measure acoustic power radiated into a room from a variety of positions. Other systems incorporate internal microphones to monitor sound output and infer a global response, or the total acoustic power radiated into a room. Microphone data is fed to internal circuitry like a processor and DSP, which filters or otherwise equalizes audio signals sent to the speaker drivers. Apple's solution builds on prior global equalization solutions by employing multiple microphones located both inside and outside of a sealed speaker enclosure. In some embodiments, an internal microphone is positioned within the back volume of a speaker enclosure, or the cavity beneath a low frequency driver. A second microphone, or multiple microphones, located outside the speaker enclosure measure acoustic pressure in the vicinity of the driver. Using onboard processing, the proposed system determines an equalization filter based on radiation impedance, a calculation derived from internal pressure levels, speaker displacement, external pressure and other measurement data provided by the microphone array. This filter is subsequently sent to the DSP for audio signal implementation. Apple is promising similar acoustic technology from its HomePod device. By comparing readings from internal and external microphones, Apple's loudspeaker system is capable of dynamically responding to its environment. More importantly, radiation impedance can be calculated in real time across a range of frequencies, allowing for constant sound optimization without prior calibration. Other embodiments include two or more speakers that work together to monitor sound output. For example, the system can be made more efficient by allotting more power to loudspeakers which exhibit higher radiation resistance at certain frequencies. Alternatively, the system might apply adaptive equalization filters such that the two or more speakers contribute the same acoustic power. This latter embodiment is preferable when a single speaker overpowers a second or third speaker because its radiation impedance is higher at specific frequencies. Whether Apple intends to use today's invention in its upcoming HomePod speaker is unknown, though the company described similar technology in announcing the device last month. 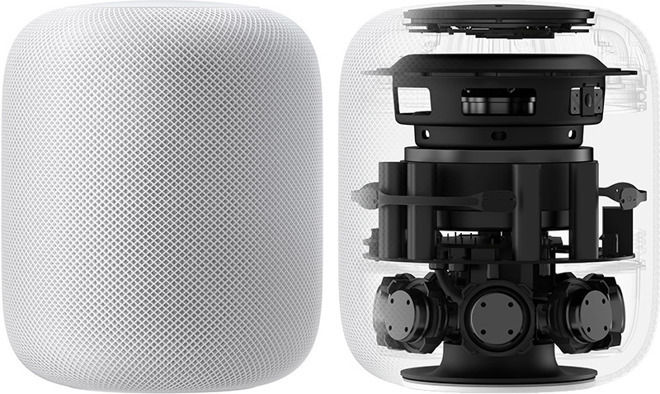 Specifically, HomePod's A8 processor and at least six external microphones power acoustic modeling, audio beam-forming and multi-channel echo cancellation features for seven beam-forming tweeters and a central four-inch woofer. The device can automatically detect its surroundings and tailor audio output to match, Apple says. Further, when two HomePods are combined they automatically work together to provide room-filling sound. 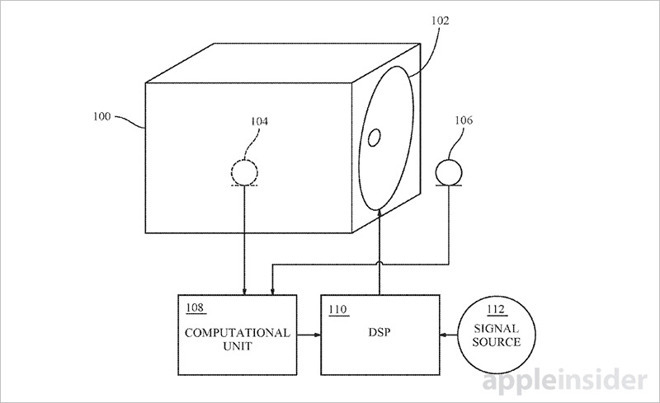 Apple's loudspeaker equalizer patent application was first filed for in January 2016 and credits Sylvain J. Choisel, Martin E. Johnson and Jack Y. Dagdagan as its inventors.